Heat oven to 425°F. Crush cereal. (To easily crush cereal, place in plastic bag or between sheets of waxed paper, and crush with rolling pin.) In large bowl, mix crushed cereal, beef, rice, milk, dry soup mix and egg. Using wet hands, shape mixture into 30 meatballs. Place in ungreased 13x9-inch baking dish or 3-quart casserole. Pour water and tomato juice over meatballs; stir gently. Cover and bake 50 to 55 minutes or until rice is tender and beef is no longer pink in center and juice is clear. Accompany this appetizer with thin slices of toasted French bread to catch the sauce when serving at holiday parties or any time of year. 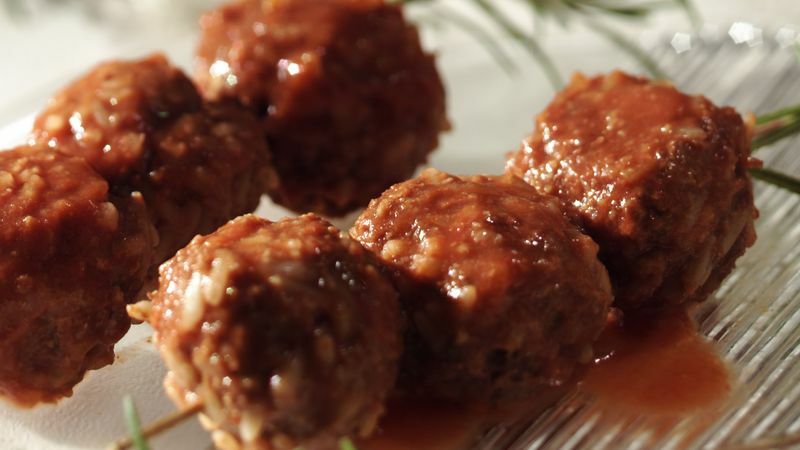 Evenly shaped meatballs are easy when you pat the meat mixture into the baking dish and cut into 6 rows by 5 rows. Roll the squares into balls and return to the dish to bake.